This section of Back to Basics is completely driven by YOU. I'd like to show new artists not to be discouraged when they see what masterclass artists are creating. We all start at a basic level and progress as we practice and learn, perhaps bringing something new to the hobby but at least painting from the heart. You can contribute by visiting Wargaming Tradecraft to send an email to me. Include photos of a mini or two that you painted when you first started out and another that shows how you've improved; if you like, also share some words of wisdom. As a reward for baring all, I'll pimp your blog if you tell me where to point the link. This series will continue as long as you keep sending me content - currently, I need more! Go light on the primer. Choose primer depending on what colors you want to paint. Grey isn't a half bad idea. Learn to use washes, it's a fantastic way to improve your painting! The original was painted in something of a hurry because I wanted my thousand points of Word Bearers on the board nice and quick; as few colours and layers as possible, with most of the details either drybrushed metal or left plain black, and the minimum of fussy freehand work. Once I'd brushed the dust off (and there was a lot of dust) and lined him up to my newer paintjobs, I realised that I had actually come along quite a way in nine years after all, and decided to give him a quick spruce-up in my new style. A few thin layers and inks on details and a tweak to the composition (more lettering on his armour and banner, introducing the white furs to really draw attention to his face, and blinging him out a bit with the bone and gold components, and a flick of Scorched Brown across boots, ground and cloak hem to tie him into his base a bit more) and I think he's scrubbed up rather well. He doesn't *quite* fit in with my vision for Chaos (he's a bit too barbarian-chief-in-space; and I prefer something that might be described as 'mutated baroque'), but I'll work something out. The fact is, I didn't care about that sort of thing nine years ago, and now I always have some sort of vision in mind before I sit down to paint something, which seems like development to me. Von's top tip: variety is king. The Cryx army in my final photo features lots of different unit types and five different colourschemes, united by their basing and by the use of the same colours and techniques for metallics and corrosive green manky stuff. There's no surer way to destroy your hobby soul than painting the same model over and over and over again. For much the same reason, don't buy the whole lot and set yourself up with a painting backlog; start small, paint 'em up, get your game on, and interweave the painting and the gaming so that the one motivates you to do the other and you can give yourself a break. First up is a Killa Kan. 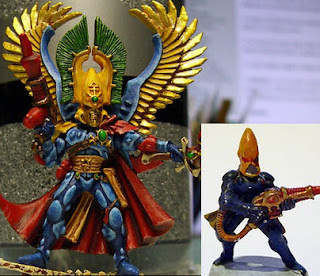 I painted this around 2006 when I got into 40K. It's one of the very fist models I painted. I scoured the internet for painting tips and advice and this was the result. He's still in my collection now and is used in almost every game I play with my Orks. I've also not re-painted him because I enjoy visually seeing my painting progression in my army. It's nice having those reminders of where you began. The Warboss I painted, I believe, early 2010, though it could be late 2009. This is one of the models I'm the proudest of, though the poor sod doesn't get used nearly enough in games. You can see I discovered washes, my battle damage technique improved, just my general approach to painting was different. This model was the culmination of years of experimenting and learning. My one piece of advice for anyone is when it comes to painting is to paint for yourself. I certainly recommend researching techniques, getting advice, admiring the efforts of others but in the end you need to paint how you want, learn on your own and experiment. Nothing replaces experience and in the end you are the only one who needs to approve of your work. Great Blog. its good see someone who gets why this is such a cool Hobby!. "and after we spend weeks lovingly painting them, get to use them in games as well you say!" I hope more keep contributing because this is a great series.